July is proving a really exciting month in terms of taking several Mantra projects forwards. At the beginning of the month, we met with Leah Wood, who is working with us on a ‘myMantra’ collaboration. Leah - daughter of Rolling Stone, Ronnie Wood - is a committed environmentalist, campaigning for two environmental charities, and taking her personal responsibility for the future of the planet very seriously. Meeting with Leah reminded me of the urgency to push forwards a change to our Mantra packaging, to include more recycled paper in our boxes. We already print our Mantra cards using Forestry Commission-approved paper from sustainable sources; but we are aiming to ensure our Mantra boxes are made from at least 40% recycled paper by the end of this year. Also this month, Sinade and I kicked off a project with Modern Muse, a charity that inspires young girls in education to see all the possibilities out there in the world of work. We ran a workshop with a group of Youth Ambassadors from the Harris Academy in Bermondsey, who are helping us create a new Mantra fundraising necklace for Modern Muse. You can read all about the project here. Last week, I was delighted to attend the launch of Mel Wells’ new book with HayHouse, ‘Hungry for More’. Mel has recently collaborated with us on two Mantra necklaces, with mantras which call out to women everywhere to believe in themselves and recognise their power. 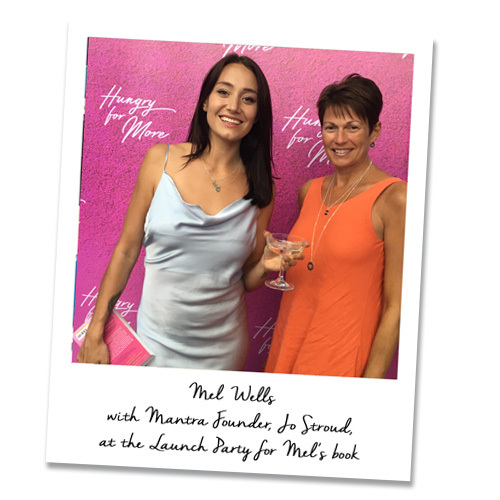 Mel hosted a lovely event at Megan’s Restaurant in Fulham, sharing stories of her personal journey and her excitement about being a published author with Hay House. I read Mel’s book eagerly over the next couple of days, and found it interesting and insightful. She talks of comfort eating and our addictions to food, drink, social media or bad relationships being a mask to hide a deeper emptiness, and asks the reader questions to help draw out what exactly it is they are ‘hungry for’? One thing that resonated with me in particular was Mel's reminder that 'How we do anything, is how we do everything', pointing out that how we eat, and how we view food, is a reflection of our attitude to life generally. Personally, although I take great pleasure in food, I eat quickly and rush through meals. This really made me think about my attitude to life generally: I am definitely too much of a 'rusher', always keen to move onto the next thing. It is a timely reminder to slow down, stop hurrying, and stop seeing 'being busy' as a badge of honour. I certainly need to adopt 'be still, be present, be mindful' as my mantra. Last week, we received the samples of several of our new Mantra designs, which we are very excited by! From our detailed drawings, we know what we are expecting – but until the piece is cast in Sterling Silver by our team in Thailand, and we see it in the flesh, it never quite seems real. 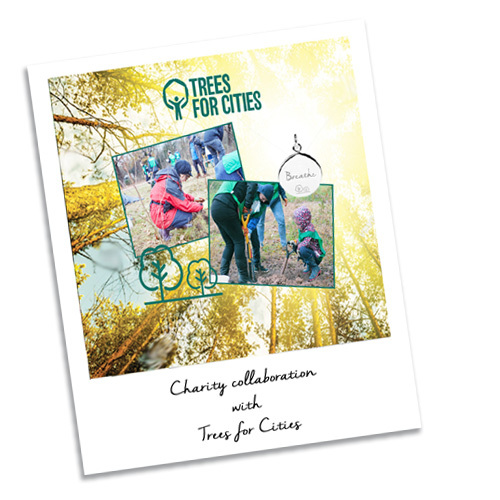 We will soon be announcing a new charity partnership with ‘Trees for Cities’, and the sample of our necklace design for this wonderful charity arrived. Three new designs for Autumn/Winter also arrived, including a beautiful moon and star disc; a lucky coin design; and a powerful new ‘friendship’ design. And a new batch of updated card designs for some of our bestselling pieces also arrived, which we have just launched online. The images that we use to bring the mantras to life are so important, and we regularly update them if we feel they could be stronger. Sinade has recently re-designed our ‘Believe’ card, and our new ‘Shooting Star’ card, to give greater impact to the mantras. Also this month, of course, we have all been captivated by the rescue of the Thai boys and their coach, stuck for so long in that dark and dangerous cave. The most incredible part of their story for me has been the fact that they never gave up hope or belief that they would be saved. This is what kept them going through those long days and nights with no food and no sign of rescue. What a powerful reminder to us all of the importance of mindset; of having total belief in positive outcomes, and trusting that all will be well. On that positive note - I look forward to catching up with you again in August!